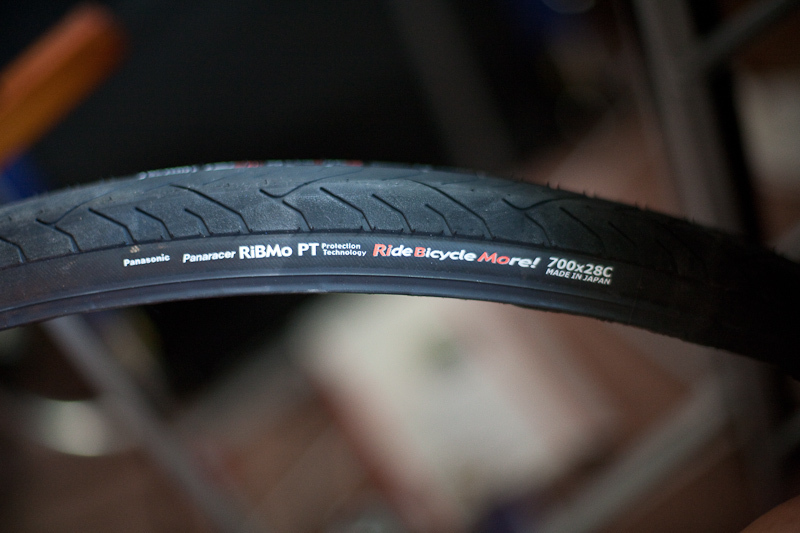 I’ve been riding my commuter bike with the Panaracer Ribmo kevlar-beaded 700×28 tires (amazon link) for quite some time now, and I think they’re great. Ok, the acronym’s kinda dumb. Until earlier this week, I could boast that I’d never had a flat on a Ribmo while riding. However, I did blow 3 tubes trying to get the tires onto the rim for the first time. The bead is TIGHT, and it was an intensely frustrating experience to mount that tire. My hands were crazy sore, and I probably broke a tire lever. BUT – in 3 years and 1 month of riding, I never had a flat. I only had to take the tire off once, and that’s only because my rim broke. The tire was much easier to take off and put back on after it had been on a wheel for a while. I rode the tires until the threads were hanging out of the tread and the sidewall and it was only then that something punctured the tire. It was probably a large staple – I recall hearing a metallic clicking sound. After a few blocks, I looked down and saw that the tire was looking sorta flat. Even when new, with their pointy triangular profile, the tires felt kind of slow. I usually rode loaded – not with much, but maybe 10-15 pounds of pannier. The tire lasted through my daily urban commute in Oakland, California, some recreational rides, and quite a few 30-80 mile tours with maybe 35-50 pounds of gear on the rack. The tire profile went from a triangular shape to that of a traditional tire when it finally expired. I put an old Vittoria Randdoneur Pro (amazon link) that I had sitting around on the wheel for the time being. I’ll keep that on until I get a new Ribmo in the mail. 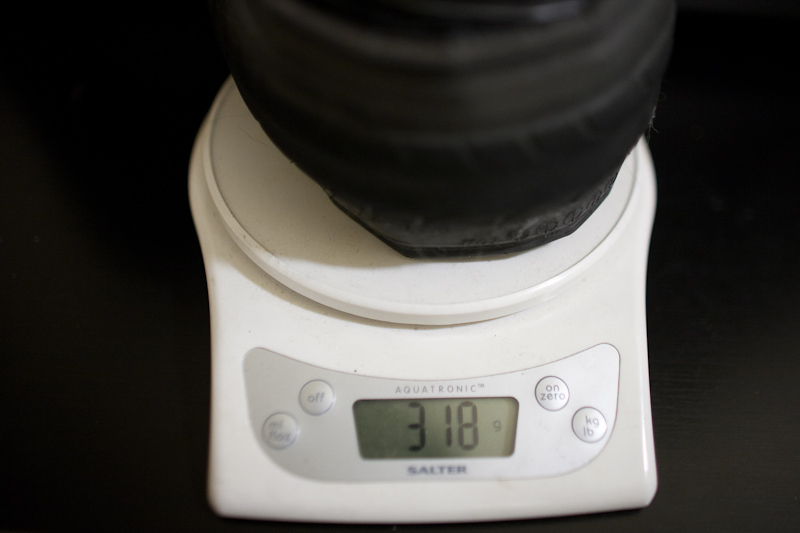 I still think it’s interesting to measure bike tire wear with a scale. Original weight: 370g. Final weight: 318g. 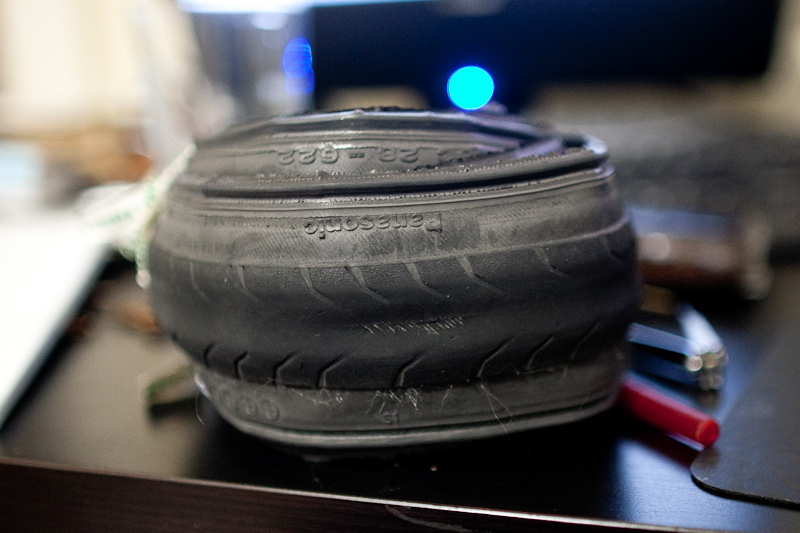 52 grams (14%) of the tire are scattered somewhere around the Bay Area. Neat! * this tire lasts a REALLY long time. I’d estimate that I put on about 4000-5000 miles in 3 years. Many of those miles were loaded. The Ribmo I have on the front, I suspect, will last a lot longer. We’ll see, as I put it on a a year and a half after the rear tire. * REALLY HARD to get on the first time. but easier after that.